Figure 1: Gaping is the phenomenon of partially opening shells which is seen in some shellfish (Butterworth filter,1,000 data points). The period is 24 hours, IMEDMAR, Valencia, Spain. 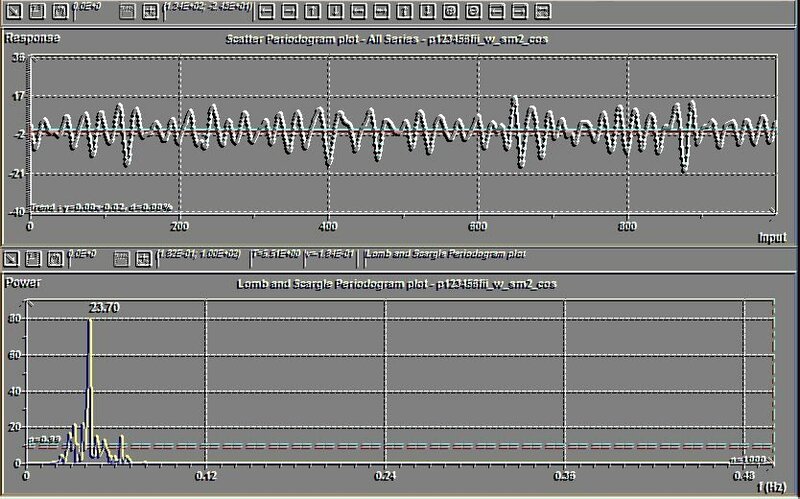 The scientific software for the rhythms analysis, time series analysis and forecasting. Jenkins and Watts, Lomb and Scargle (Scargle), Schwarzenberg-Cerny, Fourier, Burg MESA, Halberg, Gouthière : Reverse Elliptic, "Percent rhythm" to find periods. 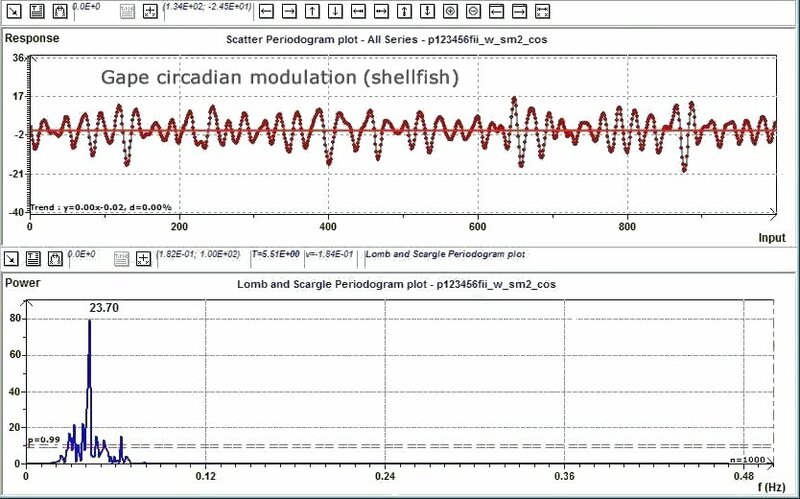 Complex demodulations plots, transformation of previous data (log, arcsin and so on), removing linear or polynomial trend, filters, variance homogeneity plot of residuals, the graphs of Normality of residuals and so on. The nature of the data is not specific and can be of varied origin : biological, physical, economic and so on. Data can be imported in the software editor, from Microsoft Excel or Cambridge Neurotechnology Actiwatch Standard and Light files. In the field, for example of actimetric studies, large data sets, e.g. more than 65,500 data points can be treated. The software also works well on short or simple data sets. Chronobiology : Principles and methods by Pietro Cugini. How to define a rhythm using a scientific methodology by Jean de Prins. Méthodologie d'analyse des rythmes dans les systèmes non linéaires by Claude Goudeau and Louis Gouthière. Cosinor-based rhythmometry by Germaine Cornélissen. Free scientific or technical support is provided by engineers.